Roop Milan Store has given you the best looking and always focuses on his customer satisfaction the brand aims and reshapes fashion in the region. With have express shipping and fully dedicated customer support team, a talented fashion team. We bring the latest traditional looking for Men`s, Woman & Kids Fashion, Shoes and more. 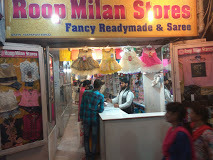 Roop Milan Store is located at PulparNear Zama Masjid in Bihar Sharif, Bihar. We famous in Bihar Sharif because of unlimited customer satisfied with us, and always make be service to easily select or full fill of customer’s selections. We make always bet, offering full collection, global brands, local brands, and with the central & state focus on customer satisfaction. Roop Milan Store has given you the best looking for upbeat the fashion, contemporary, traditional regions. We have a varied mix from the best of the best just for you to choose from us! Go online and take your fashion! Roop Milan is garment marketing company with Offline and Online presence. · Best value for money by providing low price Products. In Roop Milan Store you will find fast service maintenance by our officially friendly team members who will be happy to help you with inquires directions and assistance about the shopping throughout the team. We have a range of service to make your experience a pleasurable one. Buying online has always been a good experience but only when bought from trusted sellers, we also make mind to provide best quality product to our customer for visit & buying again with us. We re committed to ensure 100% Purchase Protection done on Roop Milan Store, so that you can benefit from a safe and secure online ordering experience, convenient electronic payments and cash on delivery, easy returns. Roop Milan Store customer service with 24x7 supports, recognized and comprehensive purchase protection provided by us.